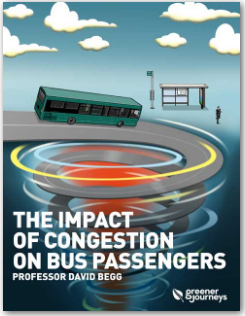 Professor David Begg is a former chairman of the Government’s Commission for Integrated Transport and was the chairman of the Transport Committee of the City of Edinburgh Council when the radical Greenways bus priority measures were introduced in the 1990s. He has been a board member of First Group, Transport for Greater Manchester and Transport for London. He is currently owner and proprietor of Transport Times, Chairman of EAMS, a non-executive director of Heathrow Airport and Chairman of the Greener Journeys Advisory Board. He is a visiting professor at Plymouth University. “In this study David rightly highlights the crisis which has developed in bus service reliability across the UK, and suggests a new and urgent need to make our buses quicker and more reliable to make our cities work better. The air quality effects of congestion are getting much airtime just now – the economic effects are as obvious but left unsaid for the most part. This study seeks to put that right.” – Sir Peter Hendy CBE. To download a copy of his report please visit the Greener Journeys website CLICK HERE.